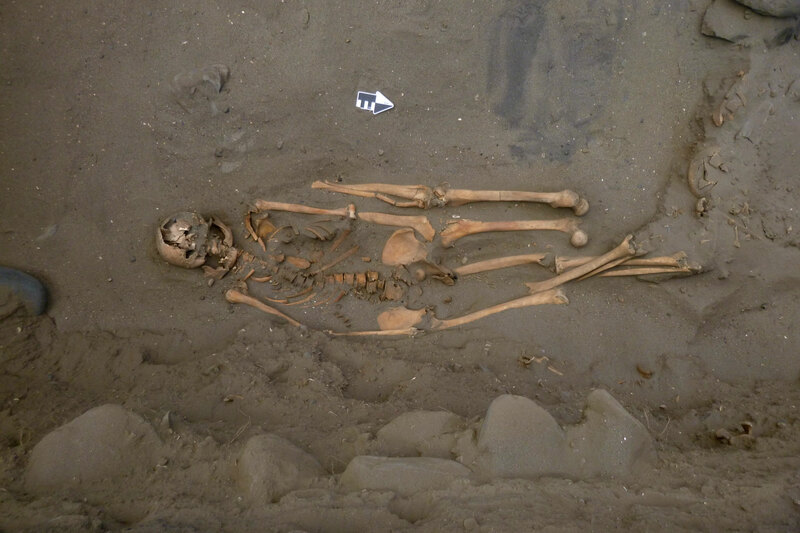 The excavation of the Huanchaco district of Trujillo which last month revealed the remains of sacrificed children of the Chimú civilization has now unearthed another highly unusual burial: people from the Virú culture buried with extra legs. The Las Lomas Rescue Project, a salvage archaeology mission to fully excavate and remove any cultural heritage discovered at the site of sewer and water extensions, has discovered more than 50 Virú burials. 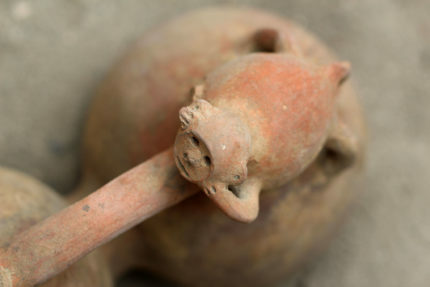 The little-known Virú culture, named for the Virú Valley which runs from the Andes mountains to the Pacific, thrived in the area between A.D. 100 and 750, before the Moche took control of the region. Campaña’s excavations have revealed a small coastal settlement along with the burials. “It’s a complex little fishing village,” he says. There’s particular complexity in many of the burials, Campaña adds, noting that around 30 of the 54 mostly adult burials appear to include not only complete skeletons, but also additional body parts. Most of the bonus limbs appear to be arms and legs. In one case, an adult was buried intact, along with two additional left legs interred right beside the body. Many of the bones show the tell-tale signs of trauma, both sharp and blunt force. Interestingly, the remains with the trauma also had the greater complement of additional limbs. This practice is specific to the Virú people in Peru. The Moche sometimes buried individuals with their amputated limbs or with sacrificial victims by their sides, but not with additional limbs alone. At this time, the archaeologists can only speculate about the motivation behind the unusual Virú burials. One suggestion is that the extra limbs may have served as a sacrificial offering to accompany the dead to the afterlife. Additional lab work will determine if there was any sort of relation between the individuals buried and the owners of the additional body parts. 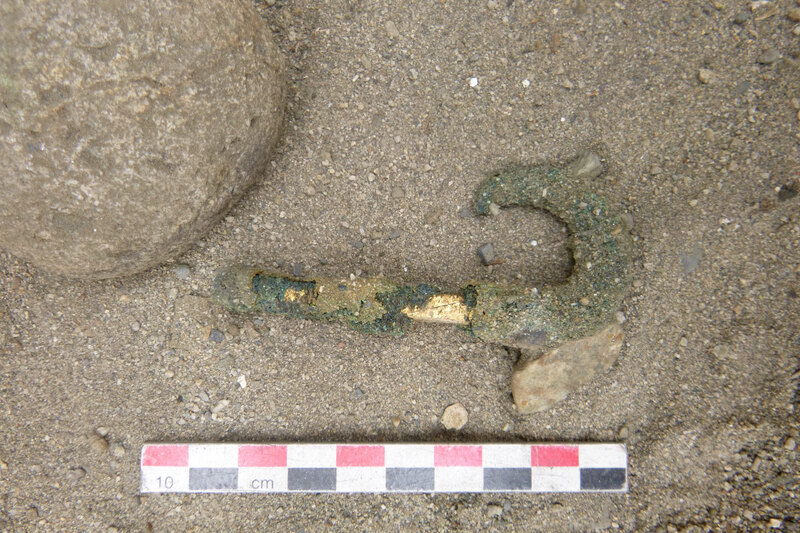 Other items of archaeological interest found in the burials were pottery vessels decorated with anthropomorphic and zoomorphic motifs, coppery sheets, jewelry, and a large copper fish hook wrapped with gold foil around the center of the shaft. The four-inch-long hook is typical of that used to catch sharks and other large fish. Now is the portion of the entry when I date myself in an extremely dorky way based solely on my reaction to a picture. Does anybody remember those monkey/koala clips people clamped to their pencils in elementary school in the 80s? It was such a huge thing when I was a kid. I know I had at least three of them. Anyway, this Virú monkey pot reminds me of those koala clips, only it’s even cuter. This entry was posted on Friday, April 13th, 2018 at 10:56 PM	and is filed under Ancient. You can follow any responses to this entry through the RSS 2.0 feed. You can skip to the end and leave a response. Pinging is currently not allowed. Ah, the koala clip. I had forgotten all about them. Maybe the limbs actually belonged to the buried person. Like, they actually were born with 3 left legs, or 2 right arms. Are we dealing with a case of ‘limb shuffle’ or ‘limbo limbs’, implemented in order to limber up the afterlife? Doesn’t the ‘National Geographic’ headline “Ancient Shark Fishermen Found Buried with Extra Limbs” allow certain ..conjectures, where the “rest” -in case there had been any- of those “additional limbs” might have ended up?!? I think the sentence stating that the bodies with the greatest trauma had greater compliment of extra limbs is telling. It seems to me that the extra limbs were spares to be used in the afterlife if a person’s own legs or arms were damaged in much the same way that grave goods were buried with th deceased for use in the afterlife. The question is, who provided the spares. Ancestors of Jake the Peg? I also remember the koalas. One of them rode up and down on a friend’s trombone slide at LaReine High in Suitland, Md. from 1977-78.